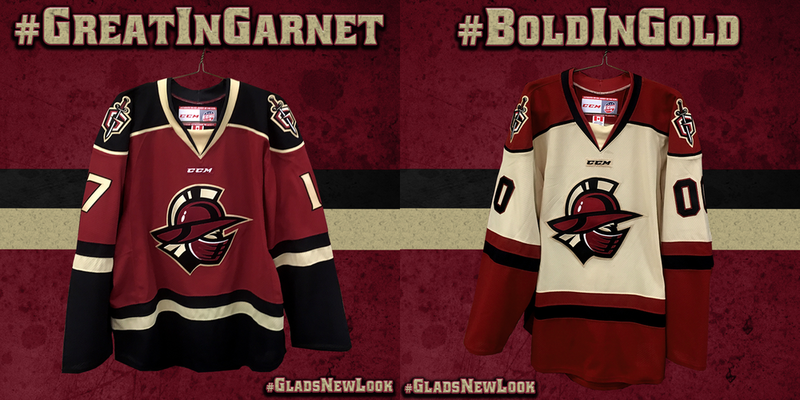 This morning, the ECHL’s Atlanta Gladiators unveiled new uniforms for the 2018-19 season — and became the only team in North American pro hockey without a white jersey! The club is shifting away from its black and white look for garnet and gold. And as in interesting interactive touch, the team will allow fans to choose which jersey will be worn for certain games. The team will offer the unique opportunity for fans to vote on and select which jersey the team will wear on specific nights via social media. The home and road jerseys along with the team’s new third jersey, that will be revealed at a later date, will also be worn without predetermined set schedule allowing for fans to see rarer “color-vs.-color” jersey matchups throughout the season. If the fans aren’t picking which jersey the team wears on specific nights, the team will decide which jersey will be the most compelling and entertaining with the opposition’s sweaters. Although the jerseys have a more traditional hockey feel and a few traditional characteristics, they are also unique and are not just a generic template worn by various teams like you see a lot in minor league sports today. We wanted this look to be exclusive to us and get the absolute most out of our already strong and established identity. There was nothing wrong with the old look by any means but we felt it was time for an update that goes parallel with all the new and exciting things we are doing as an organization. The Gladiators will also unveil a new third jersey after the season gets underway but they’re keeping the details of that under wraps for now.